This York beer freehouse (i.e., they are independent and can thus choose to serve whatever beer they like) is spread over three rickety medieval floors. Their website claims the building dates back to 1130, and I would tend to agree. The staircase was interesting. The beer selection is heavy on the Bernard pilsner, but also features at least three cask ales. I chose a Camden Pale Ale from London's Camden Town Brewery, while Linus opted for the Brown Rat by Rat Brewery, an imprint of Ossett Brewery in Huddersfield, West Yorkshire. Svea had a Hogans cider, which she said tasted like a less carbonated Strongbow. Linus and I eventually traded beers, as I really liked the smoothness of the Brown Rat, while he enjoyed the lightness of the Camden. 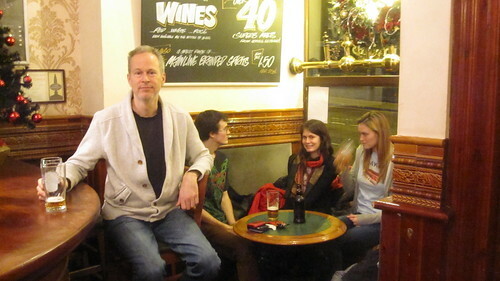 This photo from the pub's website captures the ambiance quite well. 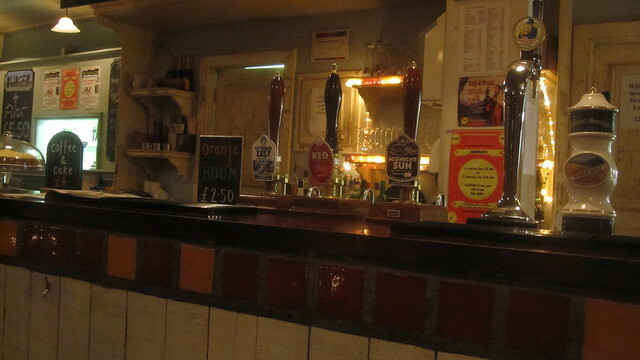 Completing our crawl of Goodramgate, we ended at the Old White Swan, a large pub with a good selection of beers. After much deliberation and conversation with the bartender about why he ended up living in York, I chose an Unfined Confidence, from the Moor Beer Company of Somerset. Bridgwater, Somerset is where my mom's dad was born. Also on tap was a Leeds Ale, which made me think of my dad's dad: Grandpa Ovans was born in Glasgow, but went to school at Dauntsey's in Wiltshire, and lived in Leeds just before his family emigrated to Canada. My parents were always buying grandpa the All Creatures Great and Small books by James Herriot for him as gifts because it was about Yorkshire, which he loved. Did you know there is a cheat-sheet for bartenders on the other side of the tap? At least for some beers. Sorry about the poor focus. 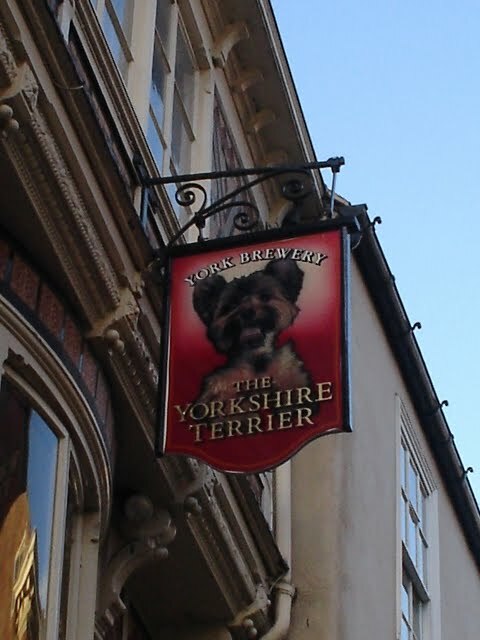 For those of you scoring at home, that was four pubs in one day in York. What is a guildford, anyway? I still remember a trip with my dad to buy a new suit he needed for some special event (probably a wedding) that took us to the new Guildford Mall in Surrey, that dreadful suburb of Vancouver. I digress. This Guildford is a very classy pub with massive windows and high, high ceilings to match. I stole the photo from their website; that's not me at the bar. The ale selection was excellent, and I had a Brains Bitter. This was my first Brains since our visit to Cardiff last year. I sat across from a guy who looked like Sean Connery. I tried inconspicuously to sketch his face. The television was all about Ghadaffi's demise. For the second day in a row, a small fly landed in my beer. On tap, a McEwan's 70, which I found to be a deliciously smooth classic amber cream ale. The pub itself was quite nice, with high ceilings and ample seating. According to Wikipedia, "McEwan's is the most popular ale brand in Scotland, where the brand enjoys a 22 per cent market share. However like most keg ale brands in the UK, sales are declining, by 63% since 2001." 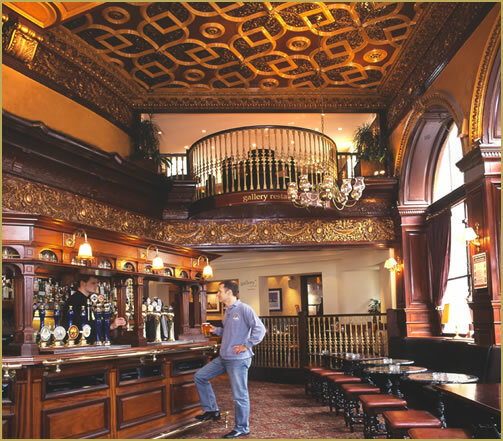 The Oxford Bar is famous for being the favourite drinking hole of Inspector Rebus, fictional Edinburgh detective created by Ian Rankin. 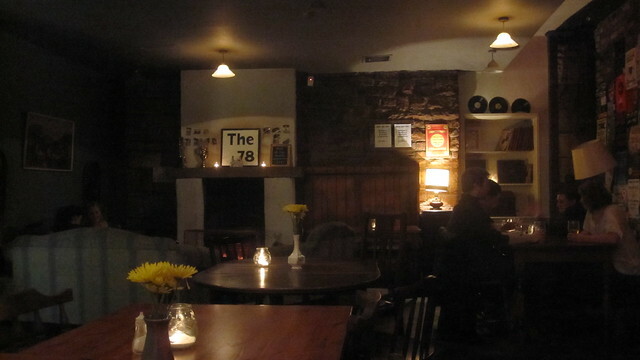 The pub was cute, quiet, and bright. 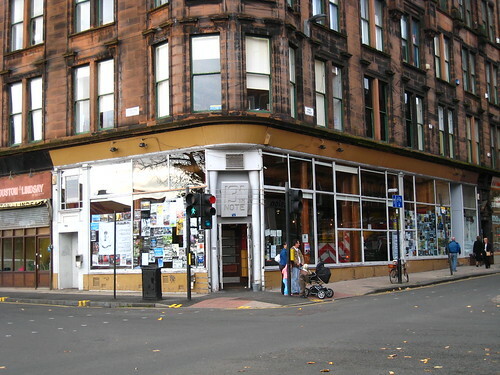 It did not resemble the pub used in the Rebus television series. My guess is the real Oxford is too small to function as a set. The bar was surrounded by a small group of men who seemed to know and like each other. Linus had his first Belhaven's Best, whereas I tried a ruby red Mars Odyssey 4.2% ale from the Houston Brewing Company. The brewery claims it is "...clean, crisp and very drinkable. Plenty of malt and hoppy bitterness together with a fruit twist." It tasted just like Linus's Best, only not as cold. Linus and I set out to answer the age-old question, Cambridge or Oxford? 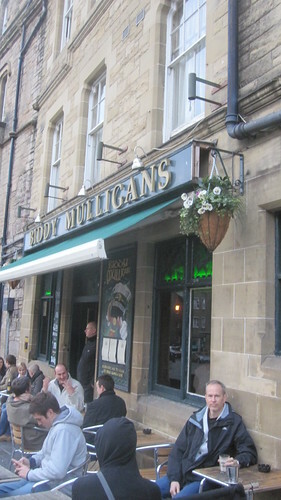 These Edinburgh pubs are Young Street neighbours, but appeal to very different clientele. The Cambridge is famous for its burgers. The interior was comfortable and clean, and the staff were friendly. We plan to return for its Monday night quiz nights to test our mettle with the locals. The Cambridge featured a delightful No. 3 Premium Scottish Ale from Stewart's. Linus and I give it, and the Cambridge, an enthusiastic two thumbs up. And the onion rings were excellent, too.